Eric has been involved in guitars since 1959. When it came time to choose a career, it was guitar, since he was (and still is) basically unemployable in any other venue; guitar playing will do that to you if you’re not careful. First, in 1963, he started teaching, which continued till just a couple of years ago. In the late 60s he became the second half of a duo with his cousin, Dave Laibman, helping Dave perform his amazing, groundbreaking arrangements of classical ragtime. This resulted in their album, Contemporary Ragtime Guitar, on Folkways Records. In the early 70s he starting drifting into a life of performing, touring the US & Europe playing solo fingerstyle guitar, playing the classical rags, folk music, blues, country, Beatles, etc. Since then he has written a book, Fingerpicking Beatles, released two solo albums,Acoustic Guitar and Steel Strings, on Rounder Records, a duet CD, Late Night Conversations with Richard Scholtz, on Live Music Recordings, and several contributions to anthologies. 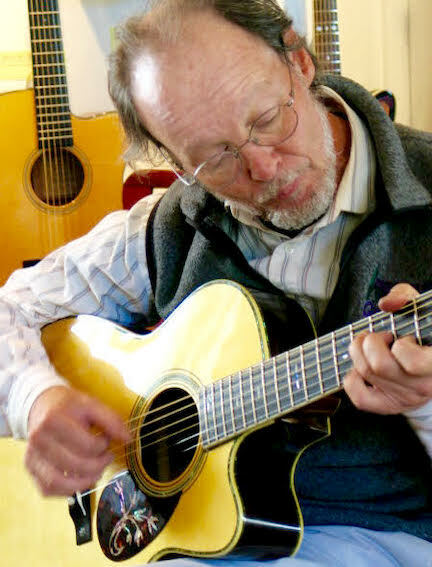 He has run a concert series, owned and run a guitar shop, Eric Schoenberg Guitars, in Tiburon, CA, and produced a line of high-end classic steel-string guitars, Schoenberg Guitars. So far, approximately 350 guitars have been produced.